Beet is sometimes used as a source of natural sweetener in baked goods. When I eat beets, I don’t add seasonings because of its natural sweetness. Since I had leftover roasted beets from last week, I decided to make some beet juice. In fact, the first time I had beet juice was at a breakfast during my vacation in Playa del Carmen, Mexico. I still remember how amazed I was when I first tried that delicious beet orange juice. The citrus sweetness from the oranges went so well with the sweetness of the beets. I have been wanting to make it at home and finally I did! Place all ingredients in a blender/juicer, blend until smooth or desired consistency. ( I like mine to be slightly grainy, so I can chew on the beet bits. If preferred more liquid, add a few pieces of ice cubes. 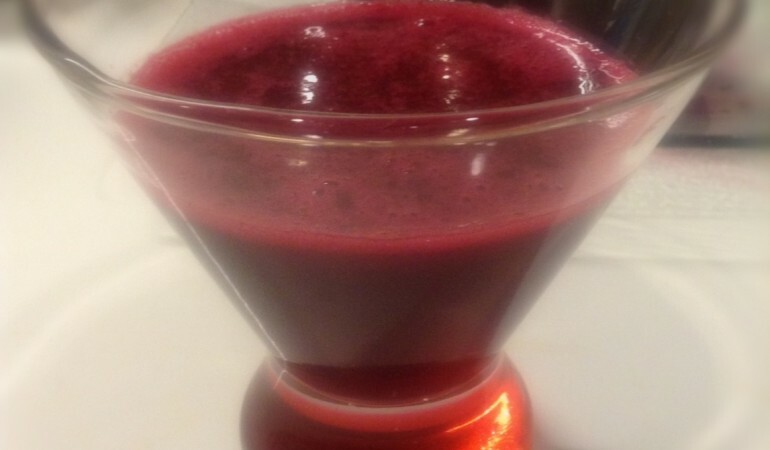 1 cup of beet orange juice will fulfill 1 serving of fruit and 1 serving of vegetables. * Recommended daily servings: 2-3 servings of fruits and 4-5 servings of vegetables.